Today, I'm actually tidying up my room - It's a shock, I guess turning 17 and being ill changes a person haha. So, today i decided that i'd go out and buy some cheap boxes, I got 2 for 99p each, you can get these from any pound land place etc. (the two plastic boxes at the top). I also had from a while back 2 tin type things that i brought from charity shops (the black art-deco type box with lipsticks in behind the purple tin thing with my brushes in) - they came in very handy actually and were under £3 each. The black box was from my MAC order online, the green from my birthday and the other big plastic one was from the same place i got the two smaller ones this was also just 99p. So it didn't cost that much at all to get things organized! 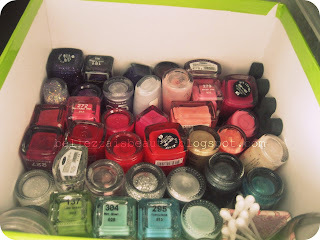 So, here is my new make up storage, in my old cupboard that just had old clothes thrown in it that were either too small or that i didn't like or ones that were too small and i liked them - hahaha. 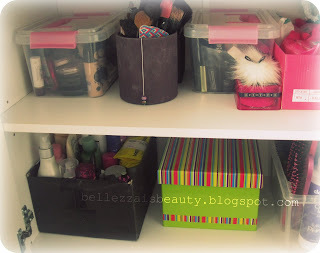 But those shall be going to charity and I have a new and more organized area for my make up and hair bits and bobs. So there for I'm not just helping myself out, but also a charity :) yaaay!!! I actually feel better now thats its all in one place, sounds weird I know. It also gave me a chance to throw out the old - so that I can go and buy some new things hehehe.